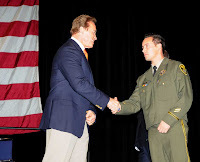 Governor Arnold Schwarzenegger awarded the Governor’s State Employee Medal of Valor Dec. 10 to 27 state employees who demonstrated extraordinary acts of bravery and heroism. The Medal of Valor is the highest honor that California bestows on its public servants. This was the 50th Anniversary ceremony. Ironwood State Prison Correctional Officer Christopher Briones was one those individuals to receive the state’s top Medal of Valor Honor. He was a Gold Award recipient, the state’s highest honor. Officer Briones was a recipient of the CDCR Medal of Valor for actions during 2008, at the CDCR MOV Ceremony in May 2009. On Oct. 24, 2008, Officer Briones arrived at an uprising in one of the prison’s dining halls, where a fellow officer had been knocked down by rioting inmates. He shielded that officer from repeated assaults. At that time, there were more than 300 rioting inmates in a dining hall. Both Officer Briones and the fellow officer he was rescuing, were being pelted by food trays, cups, and kicked and assaulted by inmates.